Loft appartement met lift naar het appartement. Een oase van rust en privacy! Het kanaal is de grote appartement tussen Anne Frank Huis en het Leidseplein. 75 m2, Vide met mooie kamers met uitzicht op Amsterdam en de Westertoren. Midden in het centrum, vol van private en toch ontspannen! Goede Bonen koffie inbegrepen !! De foto's van het appartement om de woorden aan te vullen: Een modern, luxe appartement voor de gasten om zich wat te genieten. Alle meubels zeer luxueus en modern. Badkamer en douche gescheiden. Voertuig tot het appartement op de 5e verdieping. Wow. We've really enjoyed this spacious apartment in the heart of Amsterdam. The view is great and the moment you set foot out of the front door you're walking past the canals, straight into the city center. Kees, the owner, is a nice guy. He explained everything to make our stay as pleasant as possible. I would definitely recommend this one. I am allways glad that my guests have and had a good time in the apartment and Amsterdam! Hope to see you again and till than:all the best! Our stay at Kees Amsterdam apartment was great. THE LOCATION! Is awesome. The Jordaan neighborhood is great and you are literally out the door and looking at the canal. There is food all around, playgrounds near, and great shopping. THE VIEW! Is also awesome and the upstairs sleeping area has doors that open up to the Amsterdam rooftops. So great. Kees was immediately responsive once we booked and was very communicative through the whole process. The cleaning lady met us when we arrived and the apartment was clean and ready to go for us. There is an elevator that was GREAT for us and our kids and all of their stuff. The neighbor was also helpful when we were having some minor issues with the elevator. The amenities are also great. Everything you need, pots, pans, refrigerator, etc. Big dining room table. Would I stay again - Absolutely! Even despite the couple not-so-goods. Overall it would have been a complete 5 stars, but we were promised an airbed for our kids and there were 2 airbeds, but no pump to inflate them. It would have made our stay a little bit more comfortable and we could have gotten one from our friend who lives in Amsterdam. She asked us numerous times and so I confirmed with Kees a second time. I'm sure it was a mistake, but I'm just being honest. Still a great place. Also, the stairs up to the bed are very steep for little kids. Our kids are 2 and 4 and we had to watch them all the time because they could easily fall. 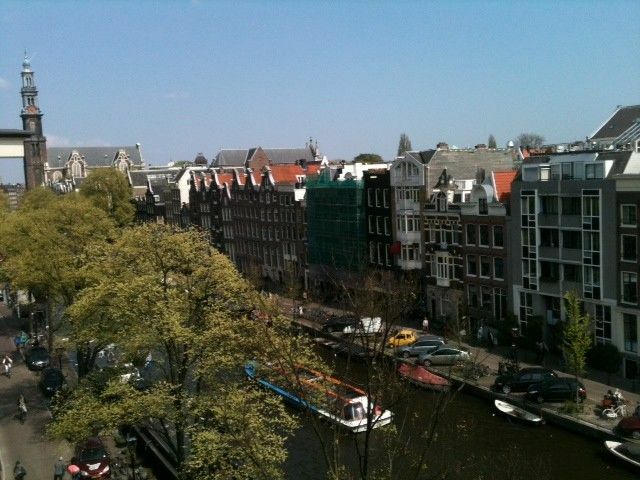 The apartment is ideally located on the Prinsengracht canal, and has spectacular views toward the east and north. The apartment is very beautiful, very clean, quiet and has updated appliances. Our one regret was that we weren't able to stay longer. The owner was very helpful, and communicated in English easily. Thank you very much for your excellent review Pamela! All the best for you both! Terrific apt. Just as advertised. Great outlook from the loft bedroom and main room. Owner responsive and easy to work with. THANK you very much dear Scott. Hope to see you once again and till than all the best for you! !!! Great spot, and a great host! We couldn't have been happier with our stay in Kees' apartment. Despite us arriving late (around 10pm) Kees warmly welcomed us and showed us the apartment as well as a quick tour of the local neighborhood. Note the nearby Albert Heijn grocery store only takes cash or Dutch debit cards, however there is an ATM inside as well as outside the store. Kees was also easily reachable by WhatsApp with any questions we had while there. The location is great, right on the canal and easy walking distance to many sights. The view can't be beat, sit by the window enjoying your morning tea or evening drink and watch the boats float by. It was a perfect place for a couple to explore the city. The only negative thing I could say about the apartment is that the bedroom is in a loft with a somewhat steep staircase and the bathroom is on the main floor. So middle of the night bathroom runs require a little extra care to navigate the stairs in the dark while groggy. All in all, we wish we had stayed in Amsterdam longer and would love to go again. If/when we do we will most likely stay here again. Perfecte centrale ligging in het hart van het historische centrum van Amsterdam, Prinsengracht Jordaan met een prachtig vrij uitzicht op de gracht! Een oase van rust en prive in het centrum! De 'Grachtengürt' is op de UNESCO World Heritage List sinds 2010. Alles wat Amsterdam te bieden heeft ligt op korte loopafstand! Musea, winkels, het gemak, het Vondelpark. Op 8 minuten lopen van het Leidseplein. Inklusive Bettwäsche und Handtücher. Inklusive Bonenkaffee! Inklusive Taxen,Service,,Strom usw usw. Bezahlung: 25% bei Buchung und der Rest 3 Wochen vor Ankunft. 150€ Kaution Alle Daten im Mietvertrag.